UFC rookie Justin Scoggins, ladies and gentlemen. Justin Scoggins said it once, and then again. "I’m the best in the world." This coming from a fighter who now has all of one UFC fight under his belt, a fighter who before Saturday didn’t even have his own Wikipedia page. It was, anyone would admit, a bold statement, maybe even an outrageous one. Somewhere, Demetrious Johnson and Joseph Benavidez had to be shaking their heads thinking, "Kid, you must be crazy." To the 21-year-old, however, it is his destiny. After UFC Fight Night: Hunt vs. Bigfoot, the flyweight is now a perfect 8-0. Perhaps even more impressively, he has seven stoppage wins, and it seems, endless confidence, as he made it a point to let the rest of the MMA world know that he’s got grand plans for the future. Don’t put a cap on greatness. My goals are infinite. It’s the kind of declaration that could lead to instant backlash, but asked if he was worried about that, Scoggins couldn’t wipe the smile off his face. He is simply too positive about where he’s going to care about that kind of negativity. "If you believe something in your mind, which I do, it’s going to become real," he said. "I don’t think you should ever sell yourself short. Don’t put a cap on greatness. My goals are infinite. I’m going to keep moving up. I’m going to keep improving my skills. I’ve been doing this my whole life. I’ll never say anything different. I’m never going to stop." Scoggins needed just 4:43 to stop Richie Vaculik on strikes against the fence. Despite finishing a local fighter, he won the crowd over with his post-fight speech, and then laid out his case to fight on the upcoming UFC Fight Night event in Duluth, Georgia. All in all, a very productive debut. Since the UFC flyweight division is still in its very early stages, it is possible to move up the ladder quickly. 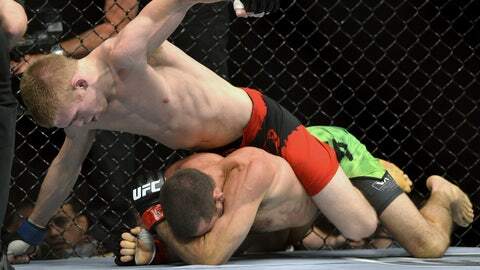 And Scoggins, who trains at American Top Team in Florida, is certainly a precocious talent to keep an eye on. "’I’m in no rush. I’m going to fight whoever’s the next best fight and take it one fight at a time. I’m going to keep winning. I’m going to keep taking it to guys because I have nothing but confidence and I know that this is where I’m supposed to be."